The Outer Banks is magical. For many, it's a bucket-list worthy destination. Whether you're a veteran visitor of the Outer Banks or a first-timer, it's important to know the Outer Banks has a culture of its very own. From getting married to vacationing with family, the Outer Banks offers something to everyone. No matter what your reasons for visiting, here are 7 things everyone should know before their next visit. Much like water sports and fishing, breakfast has a cult following with locals. It seems everyone runs into everyone else while eating breakfast. Sure, some spots are more "local" than others, but any restaurant serving breakfast does a great job. Breakfast, unlike seafood, is hard to mess up. While most people prefer to sleep in on vacation, plan at least one day to indulge in a big, Outer Banks style breakfast. Driving is one of the biggest challenges for people, both locals and tourists, in the summer. There are around 34,000 year-round residents of Dare County, but the population swells to 350,000 plus each week of the summer. When you take the giant increase in people and add the different driving styles from across the country, you find yourself in a potentially tricky situation. Given that you're on a strip of sand, it's not exactly easy to go around the block if you miss a turn. And not every place has a traffic light for you to be able to take a left turn. What do you do? Use the center turn lane. The Outer Banks lacks medians and opts for a long-running center turn lane. When you need to make a left onto Highway 158 without a traffic light, pull into the center turn lane, then find a place to merge into flowing traffic. Knowing this allows you to drive like a local and get to where you're going safely and efficiently. You probably didn't realize the Outer Banks has a dress code, but it does. It's called Outer Banks Casual and consists of flip flops or sandals and some type of loose and comfortable clothing to cover the important bits. For restaurants, you may want a clean shirt and possibly jeans (instead of shorts), but otherwise, you're fine. No need to pack business attire or formal wear for any dinner dates with your sweetheart - stick to jeans and a comfy shirt. Pro Tip: if you're attending a wedding on the Outer Banks, wear whatever the bride tells you. If she says black-tie, dress appropriately. Always do what the bride says. This may seem obvious, but many tourists are less-than-awesome towards locals. If you ask a question, listen to the answer. If you like the service, leave a tip. If someone smiles at you, smile back. The locals are here to help you, and are far more likely to show love when they are treated well. Someone might even tell you that cool little local place where they have the best peel-and-eat shrimp on the OBX. Chicamacomico – This one isn’t too bad, just intimidating. It is said, “Chick-AH-ma-COM-ih-co.” Tell the kids to say that five times fast. Don’t Like the Weather? Wait Five Minutes. Weather changes quickly on the Outer Banks. From calm skies to full on storms, the weather not only changes within minutes, but also changes depending on where you are. You’ll see clear skies in Manteo and thunderstorms in Nags Head… or vice versa. While you’re on vacation, remember if you wake up to a rainy day, it will probably be sunny by the afternoon. Pro Tip: To avoid an afternoon shower, hit the beach in the morning and early afternoon. When it rains, go shopping! You wouldn't believe what people leave in the sand. Without going into details and scaring you from ever setting foot on the beach, you should know the beach is NOT a trash bin. While it is difficult to keep trash contained due to wind, it's easy to plan ahead. Bring an extra paper baggie for the family to dispose of lunch waste, cigarette butts, and beer bottles/cans. It's fine if you drink on the beach, simply help keep the beaches clean. No one wants their toddler to pick up an empty beer bottle to put on a sand castle. Yes, it's tempting to leave your snack wrappers and cigarette butts in the sand. What's left in the sand finds its way into the ocean, which finds its way into the food supply when fish and shellfish consume it, which finds its way into you. And that’s no fun for anyone. Armed with these seven tips on the Outer Banks, you’ll find yourself ready for fun in the sun. 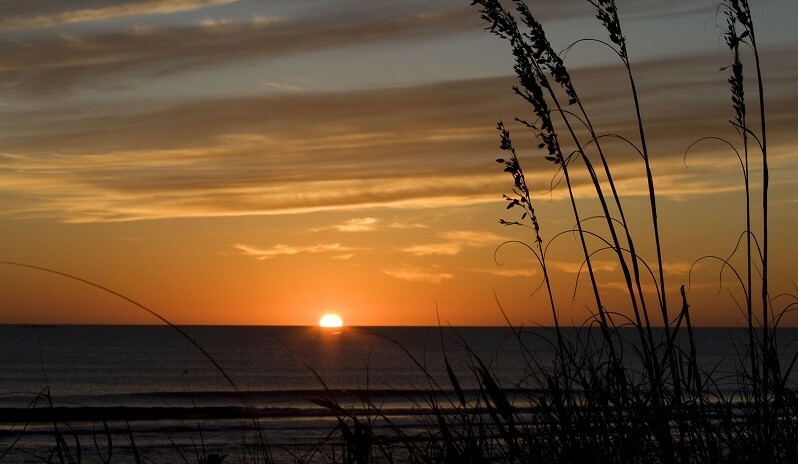 The Outer Banks is loved by locals and tourists alike. Whether you’re eloping, having a family vacation, or spending your summer surfing, everyone will appreciate your extra knowledge to maximize your stay on the beautiful Outer Banks. Next Post Don’t Panic Beach nourishment is happening.